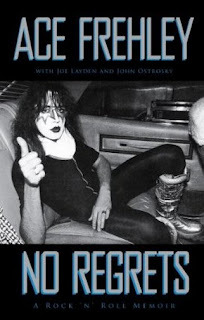 Ace Frehley’s new book, “No Regrets,” was published on November 1. Two days later, Ace kicked off a book-signing tour with an appearance at the Barnes & Noble on 5th Avenue in New York City. Footage of Ace’s first book-signing event has surfaced; the video includes Ace’s entrance and media photo-op, as well as a few signings for fans. See if you can keep up with Ace’s autograph style and/or the pace at which the store was wailing books at him to sign for the waiting crowd. Check out a free preview of Chapter 1 here.